Need 15 or more? Bulk pricing available. Please call us for details. 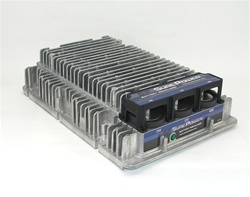 In dual battery (24V systems) it is often desirable to have 12V power available. Often this 12V power is available by tapping the battery stack at the junction of the lower and upper battery. Tapping the battery stack will result in unequal current draw from the lower and upper battery. Unequal current draw from the batteries will result in a state of charge unbalance. The lower battery will be discharged more than the upper battery. Eventually this will lead to damage and reduced life from the batteries. The battery equalizer provides an effective method for ensuring that the two batteries maintain voltage balance by providing all of the 12V current. The battery is only called upon to supply transient currents that exceed the output capability of the equalizer. The equalizer thus maximizes the life of the batteries in dual battery systems. Converters provide fixed outputs to power 12V loads directly where a 12V battery is not available. (2) Splash and , Humidity, pressure resistance is improved based on SAE 1455 Joint SAE/TMC Recommended Environmental Practices for electronic equipment Design (Heavy-Duty Trucks . (5) there is now a 100 amp 24 volt to 12 volt converter we never had before the 21100C00. (6) 2.2 LBS. lighter . The weight went from 13 LBS. to 10.8 LBS..
(7) Mounting foot print unchanged from old part numbers.